I’ll continue in the same vein as my last review and report on another of my sweet favorites. This one is a spread, typically used to complement something like bread, a bagel, or a crepe, but its heavenly flavor is far from secondary – more like the main event. 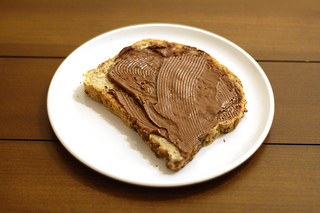 Speaking of spreads – In my college days I was addicted to the well-known Nutella hazelnut spread. 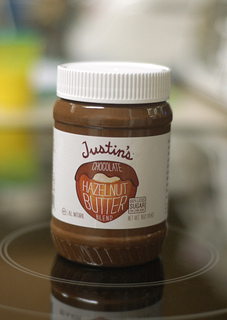 Several years later, after I had weaned myself away from that sugary goodness, I discovered Justin’s chocolate hazelnut butter. In many ways it was the healthier version of Nutella, so I decided to try it. I’ve never looked back since. It’s a bit difficult to describe the taste for those who have never tasted a hazelnut butter before, but I’ll try my best. It has a deep nutty flavor, not unlike peanut butter, with subtle roasted overtones. In this spread, the hazelnuts strike a harmony against rich cocoa and the sublime sweetness of cane sugar. Compared with everyday peanut butter, it has a high-class ambiance to it, almost as if it was made for royalty. Let me try to convey how yummy this stuff is in another way. Its addictive, very addictive. I’d feel a bit too guilty eating this straight out of the jar so I always spread it on something, usually bread. But bread itself can be quite filling, so I actually have caught myself more than once trying to eat a small dinner just to have that many more slices of bread in the evening, layered thick with “Justin”. It’s aroma is nutty and buttery rather than chocolaty, as should be expected since there is a much higher proportion of nuts than cocoa. After eating this product quite frequently for a year or so, my only gripe regarding flavor is that the texture is very inconsistent. Fortunately, there are simple solutions to get the best experience each time. When it’s overly oily, give a long, vigorous mix to balance out the oil more evenly. When its extra dry (as it was last time I bought it), mix in a few tablespoons of walnut oil. The flavor doesn’t change appreciably, but the increase in spreadability is well worth it, enabling better control over the amount used and less chance of tearing the bread. As I alluded to in the introduction, this is an upgraded, healthier version of classic Nutella spread. That means a whole lot less sugar (approximately one third of Nutella’s), and much more hazelnuts. One of my simple tests for healthiness is the number of ingredients. This passes easily, with only eight ingredients, and half of those are organic. Evaporated cane sugar, more natural and less processed, is used in place of commonplace refined white sugar. Add to that a touch of natural sea salt, produced by the evaporation of seawater. There are no vague terms such as “natural flavors”, and nothing artificial is used. For a single serving (2 tablespoons), there are 180 calories and 7 grams of sugar. The problem with spreads is that its very hard to judge the amount being used, especially if applied with a knife (as opposed to a spoon which is no small feat). I’ve noticed if I’m not careful I can easily exceed a serving *per slice of bread*, and its no wonder once after a few weeks or eating a few of these slices a night I gained a few of pounds. The good news is if you can get yourself to spread thin you’ll healthier while still enjoying the rich, nutty flavor. You’ll taste more of the bread as well, or whatever you are spreading on. For those who really want to count their calories, you can buy the single serving packs. I tried this a few times, but kept running into the problem of trying to squeeze out every last ounce, rather than enjoying my snack. More waste produced means this isn’t an environmentally friendly option either. With the low amount of sugar, where do all the calories come from? Well, it turns out that nuts are extremely fatty. Having said that, If it came to a choice of calories from nuts as opposed processed like corn syrup, I’d pick the former. Hazelnuts also naturally pack a good amount of protein (4 g per serving here), which is a nice extra. One minor nitpick is that sometime around 2012 they added a significant portion of almonds to their formula. Though I easily adjusted to the subtle change in flavor, the purist in me was frustrated by this recipe modification. I went so far as to send the company an email requesting why. Here is an unmodified excerpt of their polite response, which didn’t take too long to get back to me. Odds are whatever base you choose to ornament with this spread, the sweet, nutty flavor will overpower it. This transforms mediocre breads, which would otherwise be left to go stale, into delicious desserts. But why not be health conscious and choose a quality bread with natural ingredients? I recommend Whole Food’s “Prairie Bread” which has a diverse mix of nuts and seeds. It’s slightly stiff texture makes it ideal to help defend against tearing when using a bottle of “Justin” that happens to be a little low on oil. This combination is sweet enough to be called a desert, yet is much better nutritionally than most other sweets I eat. This spread can be found in places like Whole Foods, Target, as well as online for $8-$9. This price is undeniably hard on the wallet, but I’m apt to forgive considering hazelnuts are typically very expensive compared to other nuts. I happened to pick up my last two jars at around $6 on sale in Whole Foods. Unfortunately that deep of a discount is quite rare. A chocolaty nut butter whose addictive taste is offset by a high price tag and a minor problems with inconsistent oil content. Much healthier than some competing products, this product must be consumed in moderation to reap those benefits.